We are a small charity and your pennies really count – please support us and donate! We need money to purchase dogs from rescues, to train dogs, to train our dog training volunteers. We would welcome sponsors for vehicle, transport crates, dog equipment and administration costs. Help us get there all the sooner! Thank you! create fundraise page for yourself be it for an event, in memory of someone, as an alternative to present if you are celebrating or do your own thing. 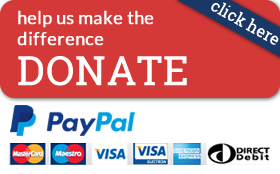 You can send your donation to gift@servicedogsuk.org or press the button below, you do NOT need a PayPal account to donate via PayPal – they accept all major debit and credit cards. You can send a cheque made out to Service Dogs UK to Service Dogs UK, 142 Fleminghouse Lane, Huddersfield HD5 8UD. Visit our causes page – click here, and press shop online and it will take you through, you will need to sign up to Easyfundraising but any donations that are made come at NO cost to you! Over 2.700 retailers have joined in: Wickes, the Body Shop, Tesco, Waitrose, Lastminute.com, Boots, Butlins, ToysRUs, Argos, Amazon, Ebay, Sainsbury’s, John Lewis, M&S and many more. Events are a great and fun way to raise money for Service Dogs UK, whether it’s a ball, a coffee morning, an organised dog walk. We also have some great fundraising ideas, plus downloads to help you. We would welcome sponsors and are very open to any suggestions. Do get in touch!